A play featuring two of the more colorful characters of the Decadent era and two of Belle Ã‰poque's biggest absinthe's imbibers, has opened in London. The tempetuous relationship between Paul Verlain, the most popular Decadent poet and Arthur Rimbaud, its enfant terrible, is the central story in Stewart Laing's "Slope". It is played in a custom-built stage shaped like a toilet bowl! Blogger ex-patriate David Lebovitz writes about his visit to Vert d'Absinthe, the shop where we purchased a couple of bottles of absinthe ourselves. Some nice pictures too. We have tasted and enjoyed both Jade products and the Blanchette (actually, another Jade family member) here at InAbsinthia. Look for tasting notes on the Eduard coming soon. We are looking forward to trying out both the Duplais and the Doubs. Congratulations to all! Unique, golden/green hue. Slow forming louche had sudden active spurt resulting in thick, almost solid, milk shake finish. Eventual colour was translucent , rich, golden green with amber highlights. The aromas after louche were slow to emerge but built with time into a complex herbal salad. Wormwood and fennel began to establish themselves on the nose with hints of spice lifting above the meld of herbs. Full textured, rich, creamy mouth with outstanding, refreshing taste with substantial fennel and wormwood flavours. Massive power, yet well controlled, long, everlasting finish. Magnificent product. I can't even begin to imagine just how bad Mexican "absinth" is. Notice in the video clip how every bottle shown is labeled "Absinth", a dead give away for a very poor absinthe imitator. The horrific "burning sugar" ritual is everywhere in this story, with nary a nod towards the real dripping water over a sugar cube method. We're told that absinthe tastes like "Yeagermeister" (sic) - jeez, I hope not! The sugar ritual makes the "bitter liquor smoother". Again, I don't understand this insistence that absinthe is bitter. None of the absinthes we've drank here at InAbsinthia has even the slightest hit of bitterness. Just who the heck is "Earnest" Hemmingway? The star in an Oscar Wilde play? They just had to get in the hysteria of thujone (and by implication absinthe) being "linked to stomach problems, convulsions and even death". And, again, to call it "banned" in the US is overstating the matter, although we should give them credit for at least mentioning its legality in Europe and Mexico. Top French foods, wines and spirits will be offered including absinthe, and Moet and Chandon - real French Champagnes. It's a party to be held at The Boho Bar this Friday and Saturday. Sounds like fun! Adelaide was one of our favorite Australian cities. Be sure to check out the pie floaters, a pretty grisly-sounding but actually pretty tasty concoction featuring meat pie covered tomato sauce floating in a bowl of pea soup wonder if it goes with absinthe? A couple of newspaper stories I've only recently come across which are still interesting reading. They date as far back as 2004, yet much of what they cover is apropos today. 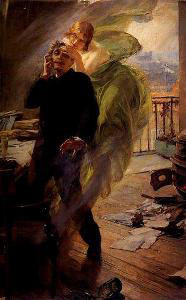 Reason: The Search for Real Absinthe: Like Tinkerbell, the Green Fairy lives only if we believe in her. 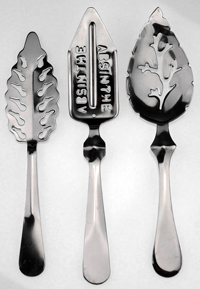 This one, from Reason magazine, is a recap of absinthe's increase in popularity. The writer interviews Jad Adams, who has become something of a de-facto expert on the subject since the publication of his book, Hideous Absinthe: A History of the Devil in a Bottle. I'm reading it now and I can't say as I'm wildly impressed, although the quotes from him in various articles seem reasonable enough. The article also talks about how bad Czech "absinth" is, as well as bringing in the old quote from an absinthe connoisseur, who decries its legalization, and subsequent popularity, as if that detracts from the taste. This article, from August of 2004, centers on Hiram, who is the proprietor of WormwoodSociety.org. He introduces the writer to absinthe and, again, talks about the bad Czech absinthe (which can be bought in Canada) and its illicit appeal. Both of those story lines can stop now, thank you very much. The article also talks about "HG" absinthe, or home-brewed stuff (the HG comes from the German word Hausgemacht). I'm not sure why home-brewed is so interesting. Perhaps because of its quasi-legality and current expense, but I'd probably stay far away from home-brewed absinthes. The Devil's Picnic is a recent book by Taras Grescoe, a prolific travel writer from Montreal. In it, he visits various places to try out the forbidden, including the likes of unpasteurized cheese in France (illegal here in the US), bull testicles in Spain and, of course, the "notorious liquor", absinthe. He searches Switzerland for a "true" absinthe. You wouldn't have to search very hard any more, as it is legal to produce there! But I have the book on order and will review it here soon. In a somewhat sensationalist article from the San Diego Union-Tribune, US officials are reported to be "surprised" at the resurgence of absinthe being found at a border checkpoint to Tijuana, Mexico. They've begun "training border inspectors to look for the liquor." and have stepped up efforts to confiscate it at the border. Aren't you glad we're being protected from this insidious drug by our ever-vigilant border patrol? Of course, the article's author couldn't resist throwing around words like "hallucinations", "brain damage", and "bootleg", while recounting breathless snippets of stories like it causing Van Gogh to cut off his ear and absinthe's "drug-like effects". The writer doesn't do too bad a hash on the thumbnail sketch of absinthe's history, and its subsequent banning throughout most of Europe and in the US, although he can't resist talking about the forbidden allure of thujone, the wormwood-extract chemical said to give absinthe's its special qualities. He turns up his nose at the Mexican brands. "It's awful quality. It's not absinthe," he said. "It's some concoction." "some concoction" - pretty funny, considering as how many absintheurs consider Czech absinths with equal disdain. We here at InAbsinthia haven't tried one yet, but we do feel it is our duty to lay our palates on the line for you, and will certainly try one in the future. Hey, it is tough work, but someone has to do it. But remember the caveat shown on many automobile commercials - "Closed course with a professional driver". I also got a chuckle out of the quote from a waiter, who says that after two or three, "you get real relaxed." I'll bet! Another one of our scheduled experiments will be to have more than two or three, to see if you really do get some sort of feeling without actually getting drunk. Hard to believe anything would trump the nearly 70% alcohol of your typical absinthe, but again, we're here to report to you and be "fair and balanced". 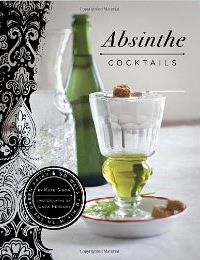 Friday, July 21 Absinthe Discussion Hotel Monteleone 10:30 a.m. $25 Absinthe historian Ted Breaux will lead a discussion of absinthe - from its early beginnings as an herbal tonic, through its immense rise in popularity during the Belle Epoque, until its eventual demise. 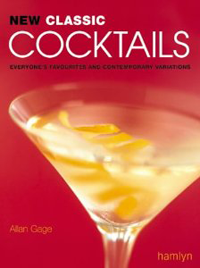 The discussion will focus on historical and modern aspects of the famous liquor, including the crafting and content of the spirit, as well as modern misunderstandings and myths. Participants will be able to view antique absinthe memorabilia, glassware, bottles, various herbs used in crafting absinthe, and a tasting will be held of Breaux's very own absinthe that he imports from France.